What possessed us to see this movie? We are still scratching our heads on that question. 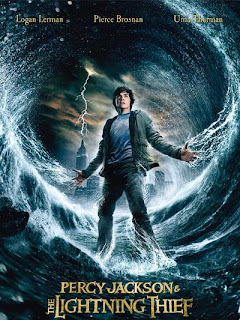 I’m sure there are those who will like the movie Percy Jackson & the Olympians: The Lightening Thief, which is based on the book of the same name by Rick Riordan. The usual suspects in movie plotlines were present: the road trip / quest, unfairly framed-person-as-a-fugitive-on-the-nightly-news, dysfunctional family dynamics, Las Vegas, end of the world, and a diabolical plan that doesn’t make sense. Apparently the plot for the movie was quite different from the book; maybe they should have stuck to the book. The one, minor plotline we will call out is the one where Percy’s protector, a satyr named Grover, gets his horns – that is, sort of graduates from junior protector. In the movie, he spent a sumptuous night in hell with Persephone and then came back with horns. What did we tell you about the over-used plotlines?